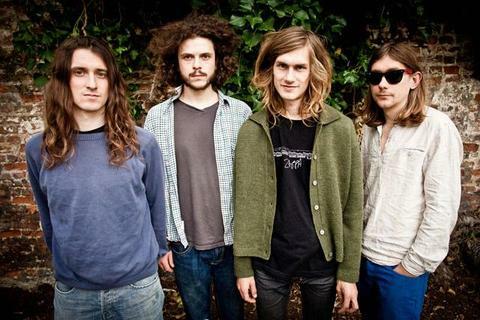 Hailed by MOJO as “Canterbury’s dazzling new sons,” Syd Arthur offer a strikingly fresh take on 21st century psychedelia, their exceptional approach born of prodigious musicianship, elemental songcraft, and an unabashed spirit of adventure. “ON AN ON,” the UK-based band’s Harvest Records debut, swings as much as it swirls, with songs like “Ode To The Summer” fusing kosmische jazz and expansive grooves with arcadian instrumentation, intricate time signatures, and lyrical, free-spirited melodies to conjure a rather potent and particular musical magic. Comprising Liam Magill (lead vocals, guitar, flute, percussion, effects, and cover art), his brother Joel (bass, vocals, percussion, effects), Raven Bush (violin, piano, mandolin, percussion, vocals, effects), and Fred Rother (drums), the band first came together early in the new millennium, initially to perform at the outdoor gatherings presented by the brothers Magill in what Liam describes as “really interesting places” around their native Canterbury. Nourished by a steady diet of jazz and funk, folk and world music, the band explored the myriad possibilities of improvisation, impelling themselves and their one-of-a-kind vision towards heretofore-uncharted territory. Thus the group took their place in the extraordinary continuum of forward-thinking artists linked through generations as the Canterbury Scene. Born as the late 60s psychedelic moment morphed into the progressive rock era, the Scene saw a loose knit cohort of like-minded Kent-based musicians fashioning a gloriously sui generis new music out of complex harmonic arrangements and untethered invention, all channeled through a profoundly British sensibility of eccentric whimsy and visionary thinking. Suffice to say, discovering artistic forefathers like Soft Machine, Gong, and Hatfield & The North proved a revelation for the embryonic quartet. Dubbing themselves Syd Arthur – a name that conjures at minimum three of psychedelia’s most magical monikers – the band looked for new ways to move forward, educating themselves to recording’s vast possibilities by building their own Wicker Studios in 2009. Conveniently located on the edge of South East London, Wicker allowed Syd Arthur to assimilate the dark arts of production, engineering, and mixing, offering them innumerable new routes for their autonomous musical activity. The Moving World EP, released through the band’s own Dawn Chorus Recording Company, arrived in 2011, followed the next year by the full-length On An On. Like any great debut, the album manages to capture the very essence of a young band taking control of its developing powers. From the slicing strings on “Edge Of The Earth” to the truly epic album closer, “Paradise Lost,” On An On sees Syd Arthur marrying off-kilter breakdowns with blissfully bucolic folk-pop hooks, the warm arrangements both colliding and coalescing with avant garde aggression. Songs like the sublime “Dorothy” are further elevated by Syd Arthur’s resolute dedication to concise, well-constructed songwriting. Pledged to the creation of an unprecedented sonic world, the band also recognizes that a solid footing is vital when making such precariously complex music. On An On justly earned Syd Arthur reams of national attention, with critical acclaim and increasingly bigger gigs, including recent tours alongside White Denim and confirmed fan Paul Weller. Next on the docket is a concerted foray into America, with 2014 already slated to include stateside visits for both Coachella and South By Southwest in addition to their own cross continental touring. Having devoted so much time to the insular development of their idiosyncratic psychedelia, Syd Arthur are keen to embark on their upcoming journey, certain the trip will fire their boundless ambition and imagination.